Our mission at SkyCraft is to get you flying. We are aviation fanatics at SkyCraft. Our interest is in the progress of the industry, which means getting as many people up in the air as we can. In order to do this, we needed to make the first truly affordable aircraft without sacrificing performance or safety. The SkyCraft SD-1 Minisport is this plane. Whether you are just getting interested in flying, or you are an experienced pilot who is sick of $100 hamburgers, our plane is for you. All of our airplanes are manufactured at our factory in Orem, Utah, with each SD-1 Minisport handcrafted by the SkyCraft team to ASTM standards for Light Sport Aircraft. Due to our location’s high elevation and extreme desert temperatures, our airplanes are built to withstand harshly unfavorable flying conditions. Once our planes roll off the assembly line, they are flight tested at Spanish Fork Airport (U77) to safety standards beyond what is required by the FAA. 7 years of Czech engineering and design went into SkyCraft’s first design, the SD-1 Minisport. The result is an airplane with state-of-the-art safety features – suitable for any beginner pilot – that matches or beats its competitors on all performance characteristics. This is done at a fraction of the cost of other light sport aircraft due to its simple, lightweight design. The SD-1 Minisport is unbeaten in its category for both initial cost and operational costs. Complete information on the design and engineering of the SD-1 along with its features, specifications, and performance data are all available on our SD-1 Minisport page. Thanks in part to SkyCraft Airplanes, the world of general aviation is now affordable. 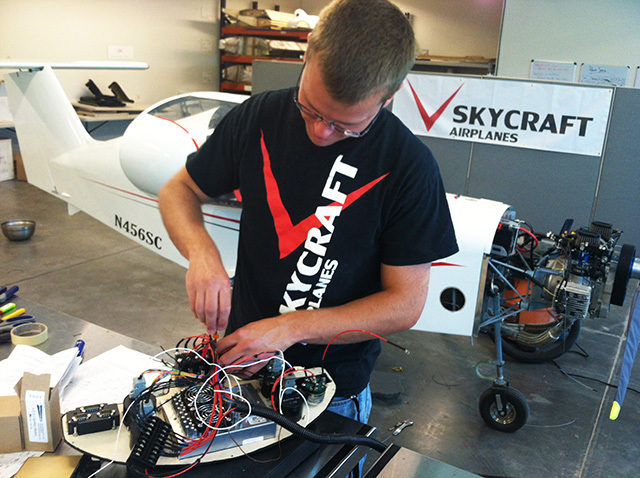 The SkyCraft team shares one common trait above all else: a passion for aviation and a desire to improve the industry. We see one glaring flaw in General Aviation, and that is that flying is too expensive. While other affordable airplanes exist on the market, none provide the high caliber flight experience that pilots have come to expect from their airplanes. Our motivation is in challenging this norm, and attacking the problems that are keeping safe, high-performing airplanes from being affordable both to purchase and operate. The SD-1 Minisport is our first answer to this problem. With its exceptional performance and safety features, $12 an hour operational cost, and $54,850 price tag, the SkyCraft SD-1 Minisport is a step forward in an industry that has taken baby steps for far too long.